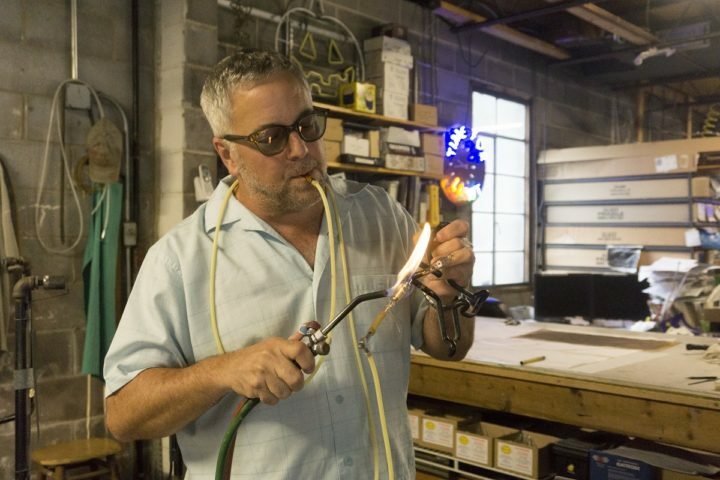 Morgan Crook, Ventex’s General Manager and Tech Support, and I had the opportunity to visit John Anderson at his shop, Mega Volt Inc., to talk about the neon industry, what keeps bringing people back to neon and more. Mega Volt, nestled on the north side of Austin, Texas, was founded in 1993 by Anderson after he worked as a scientific glass blower for the University of Texas’s chemistry department in the late ’80s. He made the move to open his own shop to focus on studio time and create neon signage. A red neon “X” is bombarded at Mega Volt Inc. in Austin, Texas. In a city where the slogan is “Keep Austin Weird,” new businesses trying to stand out among the competition is an exercise in uniqueness. While many opt for LEDs, custom-made neon signage is the go-to in order to stand out in Austin. Anderson’s favorite projects allow him to connect with local entrepreneurs to attract visitors to their businesses. One of his recent neon projects is a simple logo sign for Bird Bird Biscuit, a new breakfast and lunch joint in East Austin. Bird Bird Biscuit’s cheery sunrise-yellow neon beckons to passersby to enter for biscuit sandwiches, along with local coffee. “It’s such a mutual relationship: I’m getting work, and I’m really helping other people [get business],” Anderson said. As a longtime Ventex user, see what powers his neon work by browsing our electronic power supplies and magnetic transformers. 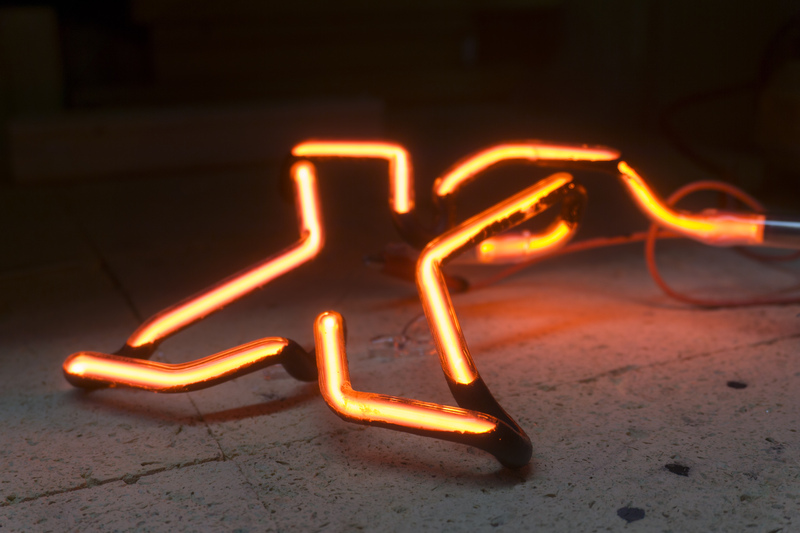 Several years into the neon trade, Anderson cofounded Neon-l, a mailing list for people in the professional neon trade. Kenny Greenberg and Tom Biebel, who were in attendance at our Neon Benders Pi Party in Brooklyn, helped Anderson start the longest-running online neon resource. An underground and perhaps little-known resource to the next generation of neon benders, the list boasts subscribers who have been in the industry for over 30 years. Crook encourages those new to the trade to sign up by visiting the Neon-l web page. Listen to what else Anderson had to say during our interview! We have used John Anderson – Mega Volt for many years and continue to use him today for all our neon sign projects. Great quality neon. He is the very few neon shops still alive in this new LED world. Great job!